Samsung's Gear watches have gone from an opportunity to joke about wrist cameras to a pretty solid wearable option. They're just a little expensive most of the time. 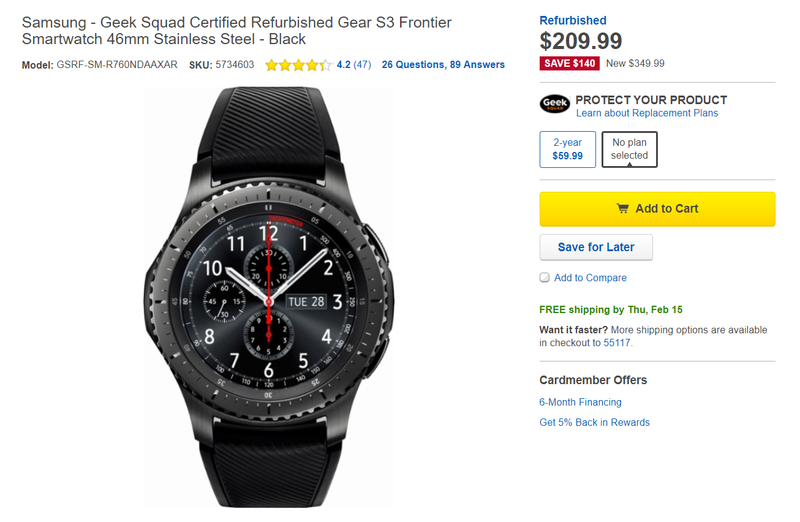 You can, however, get a big discount on the Gear S3 Frontier today at Best Buy. It's a refurbished device, but it's hard to complain at $210. The Gear S3 Frontier is a slightly larger, heavier version of the Gear S3. It has a more rugged look with a thick rubber strap. Internally, it's the same piece of hardware with full support for Samsung Pay. You can make payments at most payment terminals using this watch's MST technology. It also has a 1.3-inch 360x360 OLED display. This is a refurbished device, but it's "Geek Squad certified." That at least means someone has checked out the device to ensure it's completely functional. Buying refurbs is always a bit of a risk, but you get a $140 discount on the full retail price here.